If you are a millennial, now is the perfect time to invest in the stock market. I’m sharing here the reasons why. You should share this post, too with your millennial friends. We have more access to everything than the generations before us. We are the YOLO generation. We are not afraid to decide and live independently. We do everything to make our dreams come true. We shoot for the stars because we know we can do anything while we’re young. We can do everything we want including being self-made millionaires. The best advantage of the Philippines right now is its young work force. The Philippines has one of the youngest demographics in South East Asia with a median of 23 years. This is a great competitive edge while other countries are aging so fast, the Philippines young work force can easily adapt to the world’s evolving technology and contribute our innovative minds to boost economic growth. Because young work force means more people who are physically fit to work efficiently for a longer time. It also provides more labor revenue and investment streams. 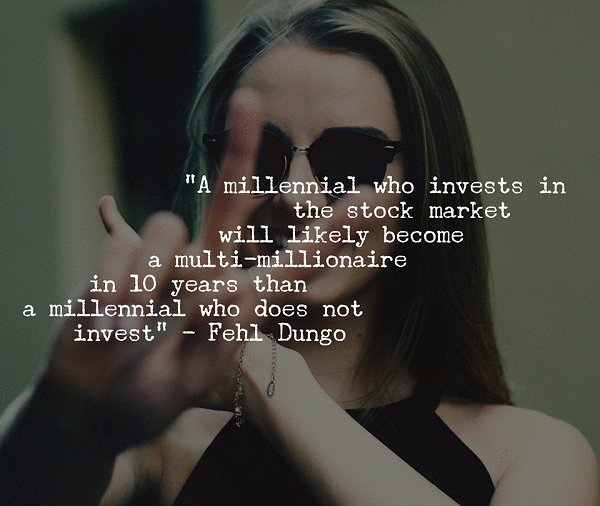 A millennial who invests in the stock market will likely become a multi-millionaire in 10 years than a millennial who does not invest. Investment in the stock market has higher earning potential than investments on savings, bonds, and other money instruments because of the ability to generate dividends and capital appreciation in the long run if invested on established blue chip companies. Millennials don’t run the internet, they live the internet. We can now get almost anything online. Done are the days when you need to phone a broker to buy stocks. Now we can buy some shares of the Ayala companies, the SM group, or any conglomerate we want. In just a click, we can view our portfolio and compare it with our friends’ portfolios. According to the Philippine Stock Exchange, last year, 39% of the total stock trading accounts use online trading platforms instead of traditional channels. I’m sure the number will increase in 2020 and the years to come. You will not only earn money investing in the stock market, you will also earn knowledge and skills. Your financial literacy will improve as time goes by. You will learn how to manage risks, how to diversify your assets and how to spend your time to keep your finances abundantly flowing increasing your net worth. Having shares of stocks means being a co-owner of companies. Eventually, you will learn how to start your own business. Millennials are known for brilliant startups…making successful CEOs. Recent studies show that millennials travel more than any other generation. The United Nations estimates that 20 percent of all international travelers are millennials, comprising approximately 200 million people. What does travel have to do with investing in the stock market? Share your views by commenting below. SUBSCRIBE it’s free! Connect with us on Facebook! I just visit this site today and naging interested po ako to invest in stock market. Matagal ko nang plano mag-invest sa stocks but I don’t How, what to do, what is the proper platform to buy/sell stocks. One of my friend actually introduce me to Nutriwealth Cooperative I don’t know kung diyan ko ba dapat i.invest yung hard earn money ko for the longterm and for my daughter’s future because of its, high return. I hope you read my message and I’m looking forward to hear from so I can start to buy my first stocks. if you are planning for long-term investing, maganda ang COL dahil regularly silang merong updates and reports. Pero if balak mo magtrade ng stocks, maganda platform ng Philstocks. Minsan kasi nagla-lag sa COL.
Also, now is the best time to invest in the stock market, many blue chip stocks are down below the Buy-below prices. Ms. Fehl, I just signed up for an EIP mutual fund. What do you think about ESG? I read a lot about it, but it seems that this fund is not a very popular one. Do you think this is a good investment? Thanks! mam, i would like to ask im 27 years old i would like to start to invest in COL but i haven’t enough knowledge about stock. Thank you! Because of you, I became very active in stock market. I want to extend my gratitude to you for giving me the courage to invest in the Philippines stock market. I am very please with the results so far. Now, I am sharing the knowledge and information you have shared with your audience to my relatives,friends and co-workers. You are one the kindest people I have ever known, well, not in person, but I’m sure you have a big heart. Again, thank you so much! You’re very welcome! I felt the hugs heheheheh. God bless! You are absolutely right Ms. Fehl, because of your being unselfish for giving informative blogs, it will be the key to our success. I started to invest in stock market last year and start gaining profit as well.